IN DHINKIA village in Odisha’s Jagatsinghpur district, residents gathered around fragile bamboo gates, armed with sticks, brooms and lathis. The gates and improvised weapons were meant to keep government officials out. The residents expected a visit from them any day after the Union environment ministry gave environmental clearance to South Korea’s Pohang Iron and Steel Company (POSCO) to build its steel plant along with a captive power plant and a port in Jagatsinghpur. The plant with a capacity of 12 million tonnes per annum was earlier granted clearance in 2007 but violent protests by people opposing land acquisition stalled the project (see ‘Police clears way for POSCO’, Down To Earth, June 15, 2010). The ministry then decided to review the project. Last October, majority of the members of a review committee constituted by the ministry recommended that the clearance to the project should be revoked. The committee objected to the shoddy environmental impact assessment (EIA) and stressed on the need for a comprehensive EIA of the steel plant and the port (see ‘POSCO review body divided’, Down To Earth, November 15, 2010). The latest decision of the ministry on January 31, allowing the project, angered protesters when they received the news. “We will not allow POSCO at the cost of the thriving agricultural economy of the region,” said Abhay Sahoo, leader of POSCO Pratirodh Sangram Samiti (PPSS) that has been spearheading the campaign against the project. He said the plant would affect 22,000 people living in Dhinkia, Nuagaon and Gadkuganj gram panchayats. Some residents of Dhinkia, the epicenter of the anti-POSCO movement, said they earn enough from betel and cashew plantations and do not want to labour in a steel plant. “We will fight to our last breath if the government tries to take our land,” declared Sahoo. The ministry, while giving clearance to POSCO, has put 18 new conditions for the steel plant and 31 for the port. In addition to these, POSCO has been asked to comply with conditions of clearances granted in 2007. “The new and reviewed clearance has not introduced any material changes,” said Chandra Bhushan, deputy director general of the Delhi non-profit Centre for Science and Environment. One of the conditions for the port clearance has sought a comprehensive EIA, which is proof that the present EIA does not assess the impact sufficiently, said Bhushan. What’s more, the conditions for clearance of the steel plant contradicts that of the port. A condition for the steel plant says water used in the power plant will be circulated five times before it is treated and reused. The condition relating to water use in the port clearance is different. “The water balance report by POSCO says the power plant will draw about 100,000 cubic metre water each hour from the sea. The hot water will be discharged into the sea after circulating only once,” said a member of the expert appraisal committee (EAC) for port clearance. This implies, POSCO will have to furnish details like the location of discharge and its impact on marine life, and obtain a separate Coastal Regulation Zone (CRZ) clearance for this. To compensate for loss to the 153 fisher families, the ministry has asked POSCO to build a fishing jetty, which would require another CRZ clearance. Sumanto Behera, a fisher, said catch has already declined. He would have to travel a long distance to reach the jetty as his village would be relocated. The port may render fishing unviable. The endangered Olive Ridley Turtles’ nesting beaches are 15 to 25 km from the proposed port site. To protect the turtles, the ministry has made marine environment conservation one of the main conditions for port clearance. But POSCO’s EIA report and other reports submitted to the EAC deny the presence of turtle nesting area near the site. The company contradicted itself in one of the presentations when it informed the EAC it will use low-density lights to prevent impact on turtles. After the Paradip port was built, high erosion was noticed on the beaches of Gahirmatha, the major turtle nesting site. Another port close by will further erode the beach, said Biswajit Mohanty of the Wildlife Society of Odisha. He added that sand dredging for the new port will affect the nesting site at the mouth of the river Devi. “Dredging will drain the fauna in the seabed on which turtles feed. Artificial lighting in the port will distract turtle hatchlings that are guided to the ocean by the reflection of the moon and stars on the water,” said Mohanty. The ministry’s stand on implementing the Forest Rights Act (FRA) in the project area has major shortcomings. The ministry has made the state responsible for complying with FRA. To this end, it has asked the Odisha government to give an undertaking that there are no legally tenable claims of other traditional forest dwellers in the project site. The Odisha government’s contention has been there are no such forest rights claimants. But a recent compilation of historical land records by Leo Saldanha and Bhargavi Rao of Bengaluru non-profit, Environment Support Group, proves otherwise. A 1961 forest department notification acknowledges rights of individuals and communities over forests and wastelands of the area. The Sarpanch of Dhinkia panchayat, Sisir Mahapatra, has papers dating back to 1931 which mention cooperatives sharing forest produce; the government claimed these were forged and slapped criminal cases on the villagers, said Saldanha. The state certification proposed by the ministry will set a bad precedent, said Mamata Dash of National Forum for Forest People and Forest Workers in Delhi. The POSCO review committee, too, had found some scheduled tribes and a number of other forest dwellers at the project site, contradicting state government’s claim. Dash said she was dismayed the ministry ignored the findings of its own committee. The port will also deprive the villages of the protective belt of sand dunes and mangrove forests, said Madhumita Roy of non-profit Action Aid, working for cyclone victims in the area. Dhinkia, Nuagaon and Gobindapur villages were directly in the path of the 1999 supercylone, but the death toll in these villages was low because of the sand dunes and mangrove forests, said Roy. Removing this protective shield will render people vulnerable to cyclones. 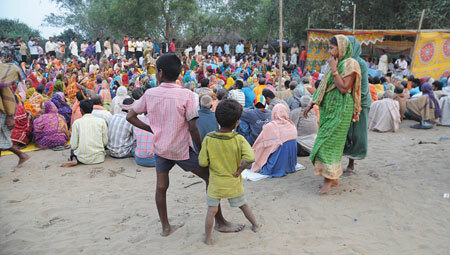 While Dhinkia residents are preparing to fight for their land, residents favouring POSCO project, too, are not happy. There are 78 families staying at the POSCO transit camp at Badagabapur, 10 km from Dhinkia. They moved to the camp in 2007 when protests turned violent. Rini Mudali, a 35-year-old woman, said the government gives her a dole which is not enough to feed her family of four. Her children have stopped going to school and her husband cannot find work as daily wager. “What is there to be happy about this manjoori (clearance)?” asked Mudali. Its a critical issue that needs to be seriously debates. Posco needs to be stopped of its adventure. The environmental and social cost of the project overruns the economic gains that are to be made by the corporate and the state government. Livelihood would in fact be snatched through land grants to the MNC. As Das and Padel (2009) have already highlighted such projects have only marginalized the local people rather then bringing new opportunities of employment. Such modernization project along Odissa coastal belt is a neo-liberal dream of extractive business that is going to do no good to the national economy. POSCO a South Korean multinational is just going to rob India of its iron ore reserves and established its high end shib building industry in the global market. South Korea is today the second largest ship builder in the world after China. The government needs to be sensible to these facts and respect the sentiments and aspirations of local people affected by the project.